28 Sep I can’t delete a project – but I’m THE project manager! It’s a bit of a mundane topic this one, but like all of my topics, it’s soooo real world! I have a customer (okay, so I’ve got lots, not just the one!) 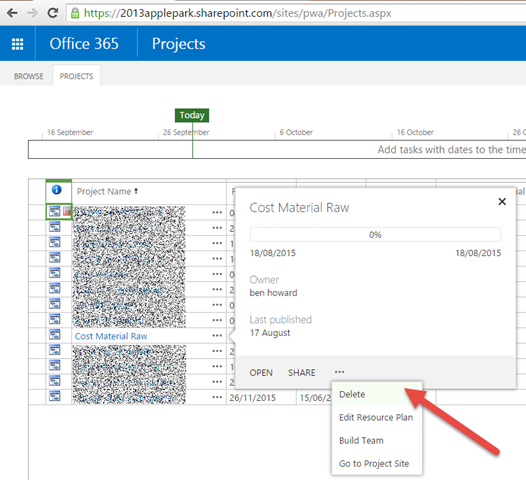 and this particular customer is only using Project Online, and not Project Pro for O365/Project 2013 Professional. For those of you familiar with this solution, this means that they are creating and editing all of their projects using a browser. The customer is also using the default permission mode of SharePoint Permissions Mode. Prior to Project Server 2013 (and hence by implication the 1st iteration of Project Online) the permissions in Project Server were based on a very granular and customisable security model; this model is now known as Project Server Permission Mode (for an explanation please click here…) With the introduction of Project Online and Project Server 2013, an additional permission model was introduced, call SharePoint Permission Mode, which provides a simplified way to manage users, and has parity to the default permissions within the “traditional” Project Server Permission Mode. One of the important decisions to make when deploying Project Server/Project Online is to decide, early on, which permission model to use. 1. Using the ellipses button from the Project Centre. 2. Using the Delete Enterprise Objects from the Server settings. Now, I wouldn’t expect a user who is just a Project Manager to have access to Delete Enterprise Objects and this is the case, but I would expect a PM to be able to access the the Delete menu item from the Ellipses button, but alas the button doesn’t exist as can be seen in the following screen shot, taken from a user who is a Project Manager! In Sharepoint Permission Mode, there aren’t any unless you deploy the project client to the PC. The project client does allow you to delete a project via it’s UI, but this assumes i) you have the money to do so 2) your users have the skills to use the project client 3) they have a Windows PC (not so good for Mac users this one). If this is important to you, please contact MS support and let them know of your concerns (I did!) (and get friendly with your local project server admin as this is the person who can delete projects!). If you are using Project Server Permissions Mode, then you can enable the global permission “Clean Up Project Server Database” which will allow you to delete your projects; however this blog isn’t reason enough to switch permission modes.